King Solomon, one of the Bible’s best-known sages, ruled for forty years, plenty of time to amass a wealth of wisdom from experience. His sayings collected in the Book of Proverbs reveal the qualities that lead to a prosperous life. And those virtues can form the foundation of a successful investing life as well, reflected in Jason Hartman’s recommendations for creating wealth through income property. 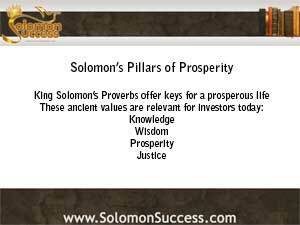 As Solomon says, knowledge, wisdom, prudence and justice are the watchwords for prosperity – and prosperous investing. In Proverbs 10:14, Solomon tells us, “Wise man lay up knowledge, but the mouth of the fool is next to confusion.” Knowledge is the foundation of wisdom and prudence, and it leads the way in preparing for a successful investing career, too. Learning about current market conditions, researching specific properties and finding out who has sound advice to offer can help a new investor to avoid costly mistakes. Current technology makes it possible to view properties thousands of miles away and to talk with financial advisors from anywhere in the world in real time, so there’s no reason not to become knowledgeable about investing. Comparing lenders, rates and conditions is only a click away, and you don’t have to be a real estate expert to get the essential knowledge you need to evaluate the advice you get from those who claim they are. And gathering all available information about a property and its local market, rather than relying on other peoples’ recommendations, can help a new investor avoid costly mistakes. Wisdom was the most prized of virtues for Solomon, and wisdom arises from using knowledge gained to make good decisions. In Proverbs 1:5, the monarch writes, “A wise man shall hear, and shall be wiser, and he that understandeth shall possess governments.” For investors, wisdom comes from collecting information, listening to sound advice and observing trends and movement in the larger context of the housing market and the economy as a whole. The wise investor weighs options against available resources and considers the big picture of investing goals as well as the immediate issue of purchasing an individual property. Prudence, too, is the investor’s friend. For Solomon, prudence and wisdom go hand in hand to create prosperity. . “Call for wisdom, and incline thy heart to prudence,” says Solomon in Proverbs 2:3. While wisdom involves acquiring and weighing knowledge to make the best decision, prudence relates to looking ahead, envisioning and avoiding pitfalls as much as possible. The wise investor gathers all the information possible and evaluates the options; the prudent one will also consider risks and potential problems with an eye to avoiding losses down the line. “The expectation of the just is joy, “ says the King in Proverbs 20:28. But how does justice relate to real estate? For Solomon, one who is just – who deals fairly with others and builds a reputation as an honorable and fair individual –- reaps more rewards than one who cheats and makes bad deals. In the world of income property investing behaving justly relates to managing finances responsibly, dealing promptly and honestly with tenant issues, and maintaining properties safely and comfortably. Everything old is new again. And Solomon’s ancient words about the path to prosperity take on new relevance in the modern world of income property investing.